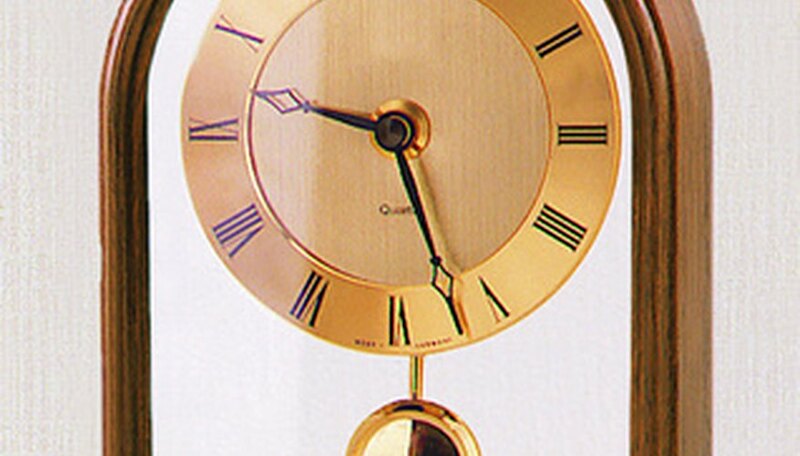 A strike pendulum clock has a striking mechanism inside that chimes on the hour. The mechanisms within a clock work together in synchronized order. The inner spring, gears and chimes work with the outer pendulum and weights on a strike pendulum clock. If one part of the inner or outer mechanisms stops working, then it affects the strike of the clock. The clock face where the hands keep time can be set to strike on the hour. The pendulum regulates how fast the clock will go. Set the time on the pendulum clock. Setting the time on a strike pendulum clock may be all that is needed to synchronize the chimes. Turn the smaller minute hand counterclockwise to number six. Listen for the strike of the clock. Continue turning the small hand in the same direction if there is no strike. Set the minute hand on the 12 when the clock strikes. Count the strikes while turning the hand. Move the minute hand to the numbers where the clock struck only if the minute hand did not strike at the six or 12. Move the minute hand around again after the 12 -- if it doesn’t chime on the 12 -- to an exact time for the clock to chime. The clock, once fully wound, should strike on the hour where you first heard the time. Adjust the speed of the pendulum and clock by moving the pendulum adjustment nut. Push the weights to see that they are working correctly with the pendulum. Adjust the weights if they are twisted. Look on the bottom of the weights where they are marked left, right and center. Put the weights in the proper alignment if necessary. Start the pendulum swinging by moving the bottom of the pendulum bob to either the right or the left. Listen for the ticking sound of the clock. If the clock doesn’t tick, check the inner mechanisms. Open up the back of the clock with a small pair of pliers, and examine the inner mechanisms. Look over the spring to see that it is in working order. Oil the spring in the pivot sections, and place a small amount of oil on the gears of the clock, where there is friction. Replace the spring with a new one if it is old, rusted or broken. Oil the clock once every three years to keep it running smoothly.